I will give to others who may go is bring comfortable shoes which you can stand in for a long time! Exhausted, we returned to the hostel and prepared for dinner at Restaurant Edelweiss. The starter was authentic Swiss fondue with bread, and a sausage with chips for the main. We were amazed by the music played to us on a huge horn and a row of cowbells during the meal. The following morning we went on a boat tour of Lake Geneva. The lake is 309m deep, has a surface area of 582km squared and a volume of 89 billion cubic metres. The first thing we saw was the famous water fountain, which was very impressive as it shoots 500 litres of water per second to a height of 140m, at 200 km per hour. During the lake tour, we passed several interesting houses, including the former home of Mary Shelley, the author of Frankenstein. fish and chips, followed by macaroons and other treats from the many amazing bakeries. In the afternoon, we went to the park. Many of us spent the whole afternoon sunbathing, with a few of us going to the science museum or visiting the very impressive botanical gardens. and Miss Parker for coming with us. 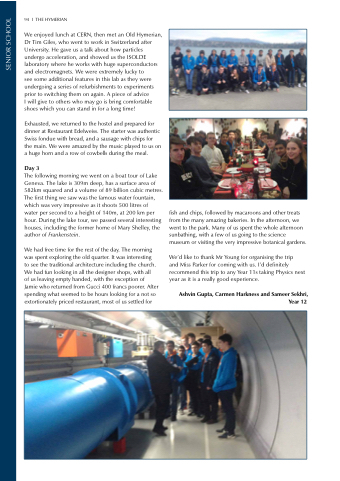 I’d definitely recommend this trip to any Year 11s taking Physics next year as it is a really good experience.